Patternicity, 2015. 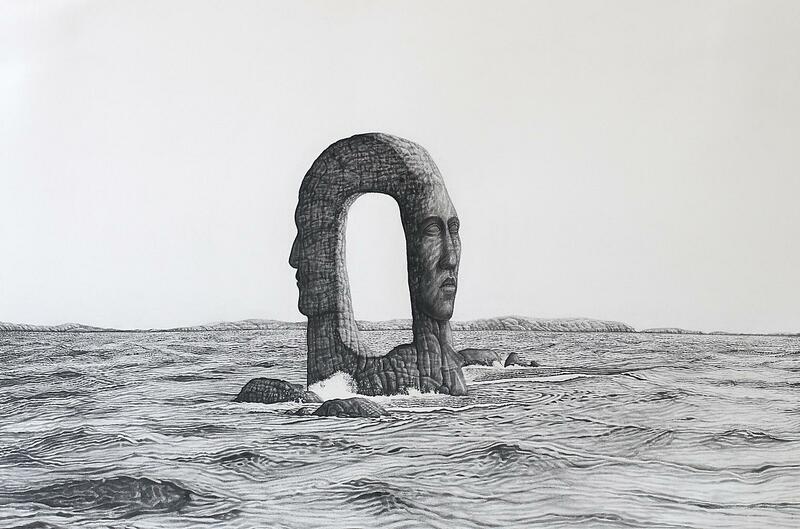 Graphite on papier–mâché on polymer, 23 x 6.5 x 6.25 in. Mamillary Body, 2014. 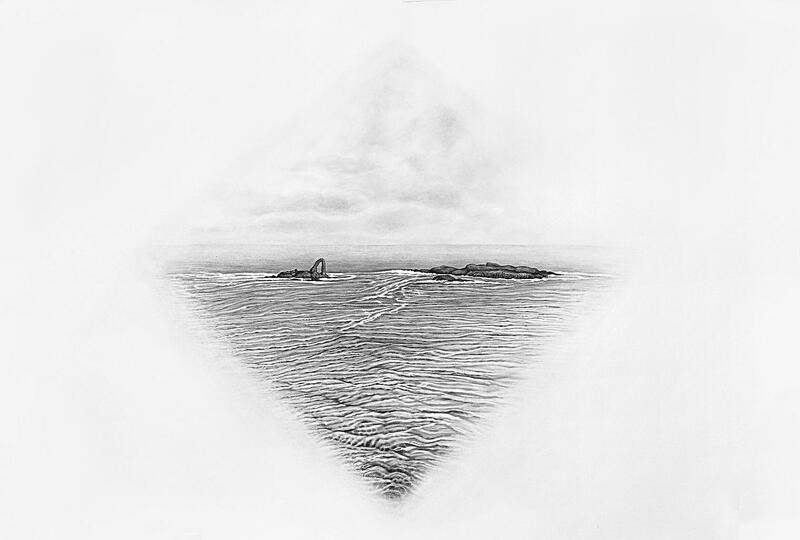 Graphite painting on paper, 15 x 22.5 in. Colette Robbins lives and works in Queens, New York. 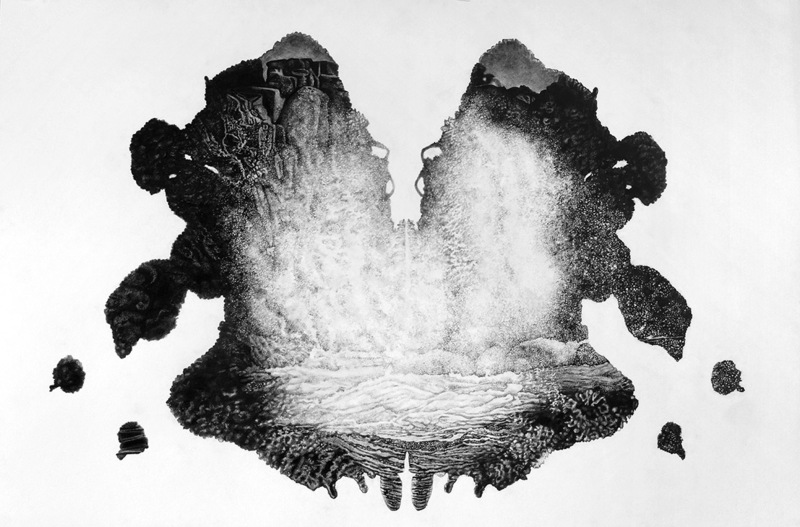 Robbins’ work emerges from her interest in human psychology, memory, and The Rorschach test (created by Hermann Rorschach in 1921), which contains imagery of inkblots has become a common symbol of psychology. These particular inkblots for the past nine decades have been imbued with the power to assess someone’s psychological state. Although they are not commonly used anymore, they are still ocassionally used for Psychological training and assessments. It is no wonder these tests were so popular. Our brains respond immediately to the Rorschach’s symmetry because we are hardwired to notice symmetry as an evolutionary adaptation. In order to survive in the wild, we needed to have the ability to instantly recognize any potential mammalian threats. 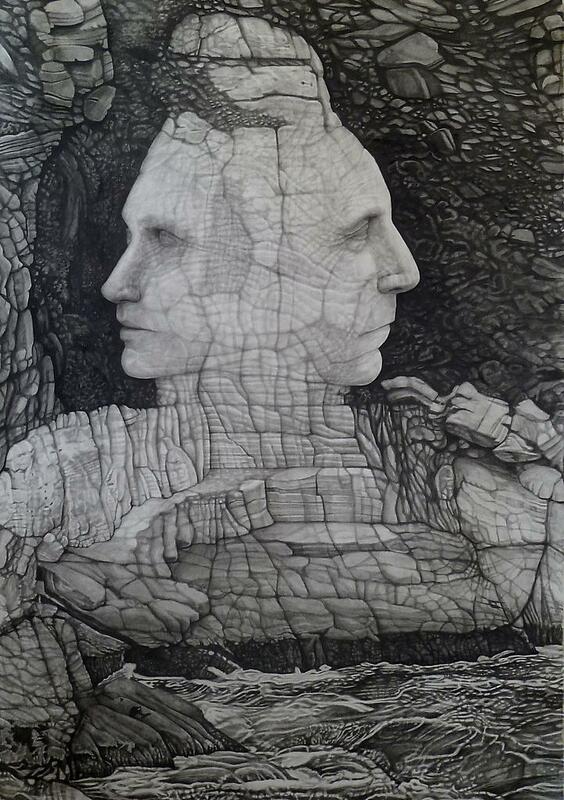 In addition to having an immediate connection with the symmetry of the Rorschach, it also inspires one to free associate its shapes with imagery from various memories. This free association process that occurs when viewing the ink blot happens whenever we view anything, including art. When we see a cloud, we pick out forms that remind us of other more concrete things. When we view a mountain or a cliff, we might see indentations that look like eyes or mouths. 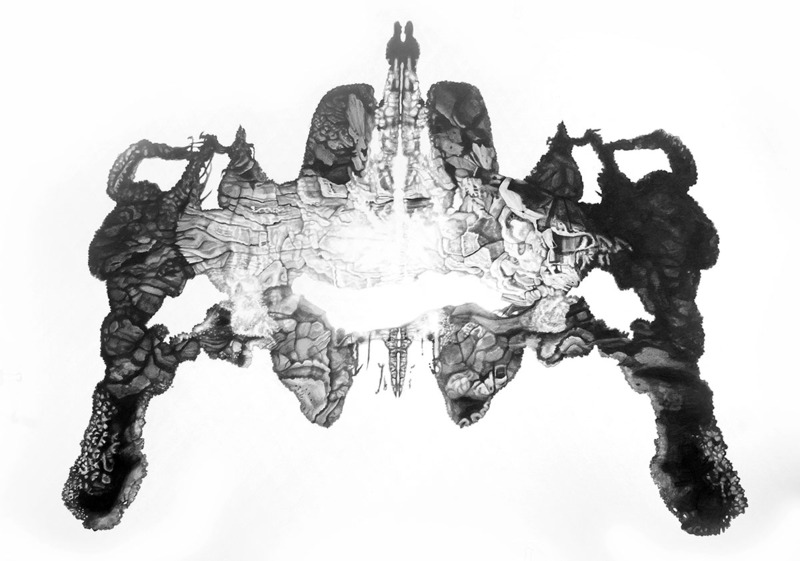 The Rorschach project is a series with in my greater body of work, Archaeological Fiction. 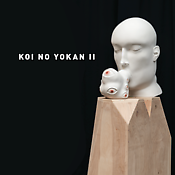 The first series with in this body of work incorporated Janus like double headed monoliths in remote oceans or cliffs. 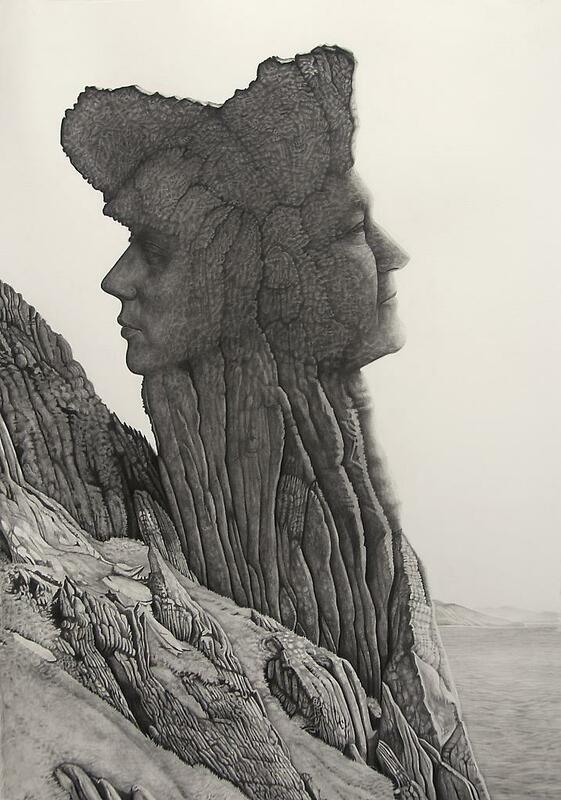 The further the series developed, the more the head forms became harder to separate from the landscape. I became more interested in the archetypal symbols in my work, such as islands, the ocean, sprays of water, mountains, and caves. 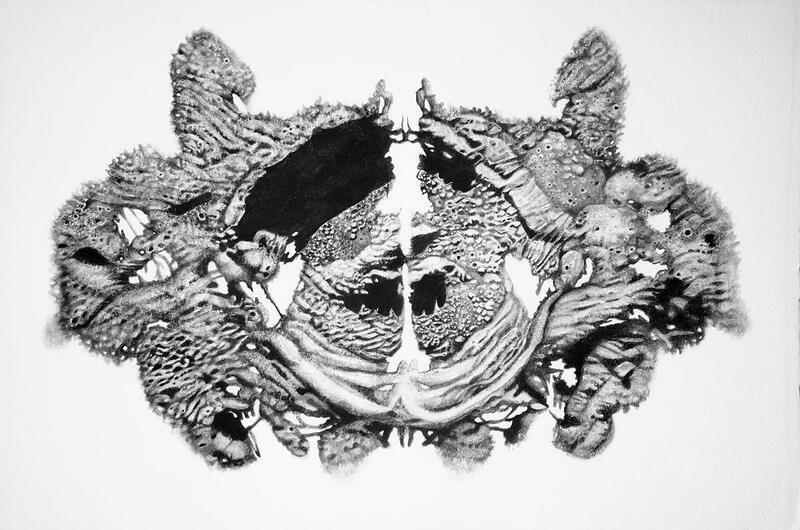 Using the Rorschach inspired inkblot shapes as a format for these universal landscapes, opens up the connection between a psychological state and the specific landscape. Since the landscapes are cropped with in this abstract form of the Rorschach, the pattern recognition that already happens when we look at a landscape is magnified and multiplied by the free association within the ink blot’s symmetrical abstraction. A rock texture becomes a pelvic bone, or sprays of water seem to morph into brain matter. Because our brains want to recognize patterns in whatever we see, this pairing of subject matter will start to create the process which author Michael Shermer (the Believing Brain 2011) refers to as patternicity. Patternicity in his words is "the tendency to infuse patterns with meaning, intention, and agency", which Shermer calls "agenticity". When we need to ignite our curiosity and imagination, our brain’s need for patternicty and agenticity can be quite helpful. Conversely, our meaning making brains can make the wrong associations which can lead to personal and cultural disasters. 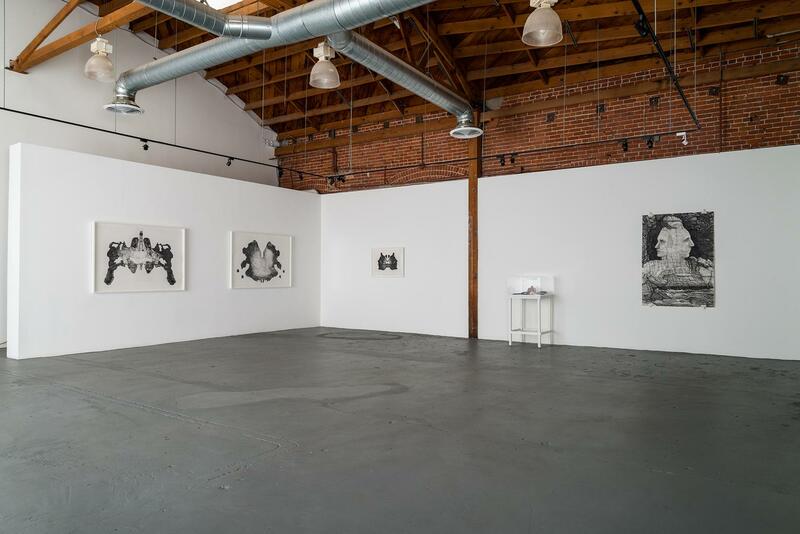 Robbins earned her MFA in from Parsons The New School of Design in 2007 and her BFA from the Maryland Institute College of Art.